The nape of the neck, or unaji, is considered in Japanese (traditional) culture the most alluring part of a woman's body. 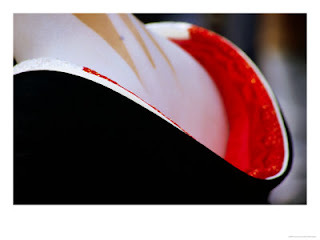 This is due at least in part to the fact that traditional Japanese dress covers almost every inch of a woman's body - leaving only her hands, face and nape of her neck. While watching dancers drift by at the milongas, my eyes are drawn to the occasional followers' hand resting on the collar or nape of the neck of their leader. Looking at pictures of the milongas later, I'm captivated by the images of followers' "tango expressions" over the shoulders of their partners, with their hands resting lightly on collars. I'm still rather new to the close embrace, but that touch, from the shoulder to back of the neck, and the connection formed there is completely visible, public, and yet can be utterly intimate at the same time. For just a moment. Fabric under the fingertips. The back of the hand brushing hair. Connected.